A Christmas Tradition . . . From the Old Country? For as long as I could remember my family always celebrated Christmas Eve the same way. After the Christmas Eve service at church, the family would head over to my grandmother’s house–or that of one of her siblings. There was a progressive meal so after awhile we would move on to another house. I remember three houses and three courses, but eventually, I think it became two houses. Nobody does it any longer as my grandmother’s generation is all gone now. While there were always a lot of delicious Christmas desserts (Grandma, in particular, was a wonderful baker), the main course–the one that couldn’t be avoided missed–was the oyster stew. Year after year, I watched the women stirring the pot of oyster-studded milk, but do you think I ever thought to ask where this tradition came from? Well, maybe I did, but I never got an answer. Maybe nobody knew. What I should have specifically asked Grandma is “did your mom make the oyster stew on Christmas Eve, too?” But I didn’t. Suddenly this year I wondered where oyster stew came from. It seemed so out of the ordinary, and my family’s holiday eating habits were not out of the ordinary at all. Turkey or ham, casseroles, cole slaw, jello dishes, cookies–“All-American” food. I thought about how Grandma’s whole family participated in this tradition. Nobody ever said, “Hey, let’s make clam chowder instead.” Or meatballs. Or tamales. Nobody said, “Let’s try this new recipe.” Nope. Oyster stew. I wondered if the recipe and the tradition had been passed down in the family. If so, they would have gotten it from Grandma’s mother, Clara Waldeck Mulder. And if it went back still further, it would have come from her mother, Alwine Noffke Waldeck, who might have been born, as her brother August was, in the little Pomeranian town Schwetzkow. Schwetzkow is about 12-15 miles from the Baltic Sea. Alwine was an adult with children when she immigrated her, so she would have brought her traditions with her. To try to get to the origins, I researched the subject through my friend Ms. Google. One of the most popular articles right now is this one: Oyster Stew on Christmas. This writer argues that the origin lies with the Pilgrims who were “oyster crazy.” She says that when the Irish Catholics came in the 19th century, they latched onto the oyster stew because it closely resembled the traditional Irish ling stew and ling (a type of fish) was not available in the United States. Hmm, my oyster-stew-slurping family are definitely not DAR and not Irish and not Catholic. I couldn’t imagine anybody choosing a tradition of oyster stew just for the heck of it. At least one article said that Germans couldn’t get oysters because the water is too cold, but then why does Russia get oysters from the Baltic? All in all, the research was very sparse about the Baltic, other than the problems with invasion of foreign species and pollution. Another issue is that in the 19th century, oysters were inexpensive and could be eaten by people without means. Canned oysters have also been readily available in the winter. I posed my question on both my personal Facebook page and on the Prussian Genealogy group on Facebook. Interesting to see the difference in responses. On my personal page, where I am friends with people who come from a wide variety of backgrounds, only two people (besides family) had heard of the tradition. They both ate oyster stew on Christmas Eve with their Swedish in-laws. This didn’t deter me because Sweden and Pomerania were on opposite sides of the Baltic, and part of Pomerania was even Swedish for some time! I wrote to my friend, the Swedish writer Catharina Lind, and asked her. She said that there have “never been oysters either in the Baltic Sea or the Bottnian sea, the east coast of Sweden. The salinity level is too low for oysters and the water is too cold. There are oysters in the Nordic sea, but very few, so oysters have never really been part of any Swedish tradition. There are no oyster dishes in Scandinavian (Sweden, Norway, Finland) Christmas traditions. Though a lot of fish, mostly herring and whitefish, and in modern times also salmon. We traditionally eat plenty of pork.” Catharina went on to speculate that perhaps the Swedish Christmas soup made with porcini and oyster mushrooms could have evolved over time to mean fishy oysters instead of mushrooms. So I thought it was all over. But then, on the Prussian Facebook Group, where everyone has Prussian, if not only Pomeranian roots, people began to chime in–lots of people have said that their Midwestern Prussian relatives always served oyster stew on Christmas Eve. Then somebody found the recipe for several German Christmas soups printed in German–and oyster stew is one of them! For oyster soup, cook the thrown oysters in the hot butter with oyster juice. When the oyster margins begin to ripen, add the milk, season with salt and pepper and heat. Serve the oyster soup in soup bowls sprinkled with sweet paprika (if desired). None of this research leads to a definitive answer about the origin of my family’s tradition. Clearly, a lot of ethnicities in the United States have claimed oyster stew. If you’ve ever eaten it, you might wonder why anybody would want to claim it. The only time I liked it was when my husband joined the family and “sneaked” wine and spices into the dish. Now it’s been years since I’ve eaten oyster stew, and I don’t miss the taste, but I do miss everybody who was there at the time. I wonder if anybody in my family still serves oyster stew! Catharina’s Christmas books are available here. I also recommend her beautiful book, “Fly Wings, Fly High!” It’s a lyrical memoir about the magpie family she shares her yard with and her own struggles with heart disease. After reading the tragic story of August and discovering that maybe, just maybe, he was born in Schwetzkow, Pommern (Pomerania), Prussia, I decided to do a little more digging. I started with the family reunion notes. The Waldeck-Noffke family held regular family reunions, had officers, and kept notes. Imagine people doing that today! The junction of the two families was the marriage between Gottfried Waldeck and Alwine Noffke, both of Prussia, my great-great-grandparents. At the beginning of the notes is an attempt to sum up the “pioneers” of the family in the United States. The first person who immigrated–or as I think of him, the canary in the coal mine–was August himself, the man who I wrote about last week, Alwine’s older brother. He was born in 1841 or 1842 and left Schwetzkow in 1869 at age 28. Shipping clerk: Louis Scharlach & Co. Hull might be a port for “transmigrants” in England. I wish I knew what “Hull (New York via Liverpool)” really means. The notes also say that August first went to Chicago, then resided in Caledonia township (Kent County, Michigan) with his parents, before returning to settle in Chicago. Also written is that the family doesn’t know when the pioneers (being August and his parents) died. So he was written off to Chicago. There are records for an August Noffke in Chicago, but then there are quite a few August Noffkes. It apparently was not a rare name. The Grand Rapids city directories show August living in Grand Rapids in 1872 (and throughout the 1880s), marrying Maria Mueller (Mary) of Big Rapids, Michigan, on 2 November 1875, and having children subsequently, all in Grand Rapids. 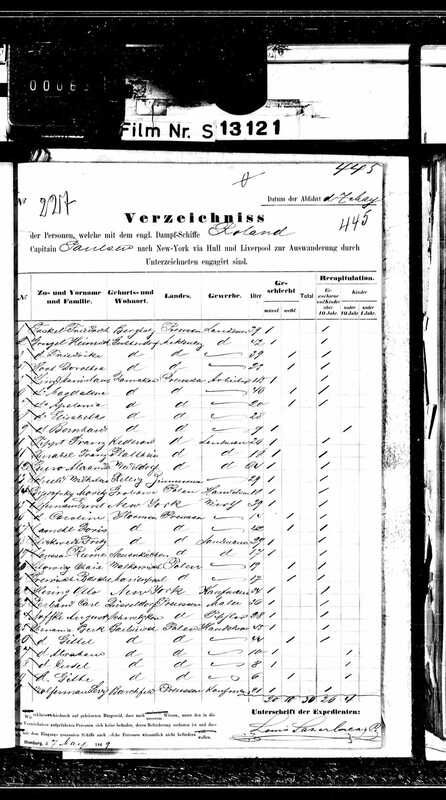 The passenger list shows that August was a tischler, which means carpenter. The article in the paper at the time of his death mentioned that he was a cabinet maker. I do wonder why he left Prussia at age 28. Wouldn’t he have been married already? Why wait until that age? More questions than answers, as usual! Apparently, August was buried at Greenwood Cemetery in Grand Rapids. I’ve requested a photo of his headstone through Findagrave. Amberly at The Genealogy Girl suggested I look for the divorce filing since the newspaper article indicated that he had tried to file for divorce and then had stopped because of the children. I am awaiting news from the Western Michigan University archives on that matter.